PDF (Portable Document Format) is a file format that has replicate all the characteristics of a printed document that you can read, write, print or forward to someone else. 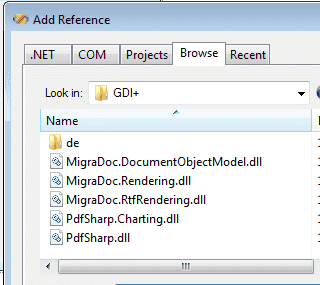 You can create PDF file programmatically from C# applications very easily. When you create documents, graphics etc. they look just like they would if printed. PDFsharp is the Open Source library that easily creates PDF documents from c# language. PDFSharp library allows you to create PDF files directly from your C# application. There are many PDF libraries available in the web like PDFsharp, iTextSharp etc. The following program uses the PDFsharp library for creating pdf file from C# application. 1. Download the Assemblies from the above mentioned url. 5. 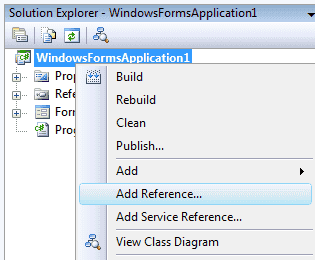 In Solution Explorer, right-click the project node and click Add Reference. In this project we are using GDI+ libraries. 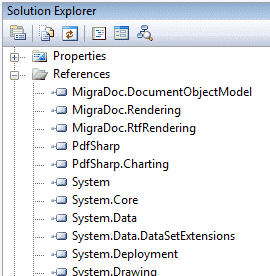 After you add the reference files to your C# project , solution explorer look like the following image. Now you can start programming to create a New PDF document. Next step is to create a an Empty page. Next step is that you should write the content to PDF File. XStringFormats.Center will place the your content to the center of the PDF page. You can specify the file path in the pdf.save function. After save the file , you can double click and open the pdf file. Then you can see the following content in your pdf file. Drag a Button on the Form and copy and paste the following code in the button1_Click event.